For Bike to School Day, it’s off to Northwoods Elementary School we go. Sitting on his red “Cars” bike, Nadir Dkhir is eager to get going on his ride to Northwoods Elementary School in Cary, mashing on the bike’s button that makes speeding car noises four or five times. The first-grader is proud that this is his second time participating in the national Bike to School Day. May is national Bike Month, and Bike to School Day is one of the many events focused on helping people understand the benefits of biking. For GoTriangle, biking is an important part of its GoTogether campaign that focuses on all the ways people can get to work or school other than alone in a vehicle. GoTriangle offers information and resources, including biking tips and maps and guides to help potential riders plan safe routes, at http://gotriangle.org/bike. National Bike to School Day began in 2012 as an offshoot to Walk to School Day, which launched in 1997 as a way to highlight the importance of improved streets, healthier habits and less traffic. Northwoods has participated in Bike to School Day every year. 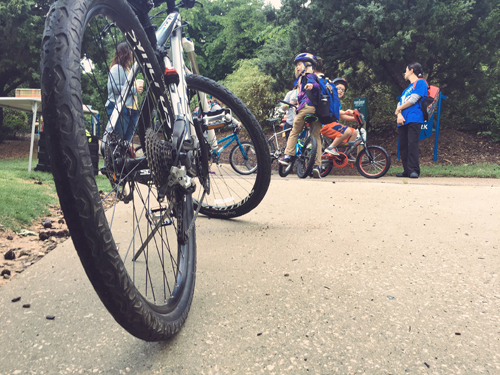 In 2016, 150 schools in North Carolina participated in Bike to School Day, eight of them in Wake County, five in Durham County and three in Orange. This year, 179 schools in North Carolina were signed up to participate, with 15 in Wake County, four in Orange and three in Durham. Two years ago, Northwoods became one of five Wake County public schools participating in a Safe Routes to School project in conjunction with the University of North Carolina Highway Safety Research Center. The center gave grants to the schools and charged them with coming up with ways to give children better opportunities to safely walk and bike to school. The other schools are Bugg Magnet Elementary School and Ligon Magnet Middle School in Raleigh, Hodge Road Elementary School in Knightdale and Lincoln Heights Elementary School in Fuquay-Varina. Their work will serve as a blueprint for other Wake County schools to create their own safe walking and biking programs. At Northwoods, Bike to School Day also included an afterschool bike rodeo that the PTA and the Cary Police Department orchestrated. At the ride, Northwoods parent Steve Goodridge, a certified cycling instructor, uses a bullhorn to stress the rules before the crowd gets on its way. Couch’s first-grade daughter Ellah waits patiently for the start to sound. Christine Kushner, vice chair of the Wake County Board of Education, attended the ride at Northwoods to show her support for finding ways to help more schoolchildren walk and bike to school. It was Northwoods parent Leigh Williams who launched the first Bike to School Day activities at the school. “I love the community aspect of it, that the whole school gets excited about it, that families do it together, that it gets people out on our Cary greenways,” she says. “Then there’s the safety aspect of it. We teach them not to ride a bike but to drive it. You’re in charge. To learn how to begin a Safe Route to School Program, visit the NCDOT’s website at bit.ly/ncdotbiking.